Which club (or regions) have brought up the most players for the senior squad of La Albiceleste, the Argentine National team? Do the big clubs of Buenos Aires like River Plate and Boca Juniors dominate in the current National team like they have done in the league? No, they don't. As you can see in the table below no single club has managed to get more than 3 home-grown players in the quad of the last and deciding qualification round for the World Cup 2018 in Russia. Boca Juniors, River Plate, Lanús and Newell's all have a total of 3 players in the NT formed at the club. The Big Five is a term which refers to the main five teams of Argentine association football. They are Boca Juniors, Independiente, Racing Club, River Plate and San Lorenzo de Almagro. With Éver Banega, Fernando Gago and Leandro Paredes grown up at the club, Boca Juniors have three homemade players at the club. With Dario Benedetto and Pablo Pérez currently playing at the club, and a loan spell from Lautaro Acosta back in season 2012/2013, the 2016 has quite a dominance in the midfield. Meanwhile River Plate does dominate the defense. Germán Pezzella, Emanuel Mammana and Javier Mascherano (who is not used as a midfielder anymore since Sampaoli took over) are the only home grown players from River and all three currently play as center back. The dominance in the defending area is even stronger if you keep in mind that Milton Casco and Gabriel Mercado have played or are currently playing as well for the 2015 Copa Libertadores winner. Not a surprise as Sampaoli never hid the fact that he is a River Plate supporter. 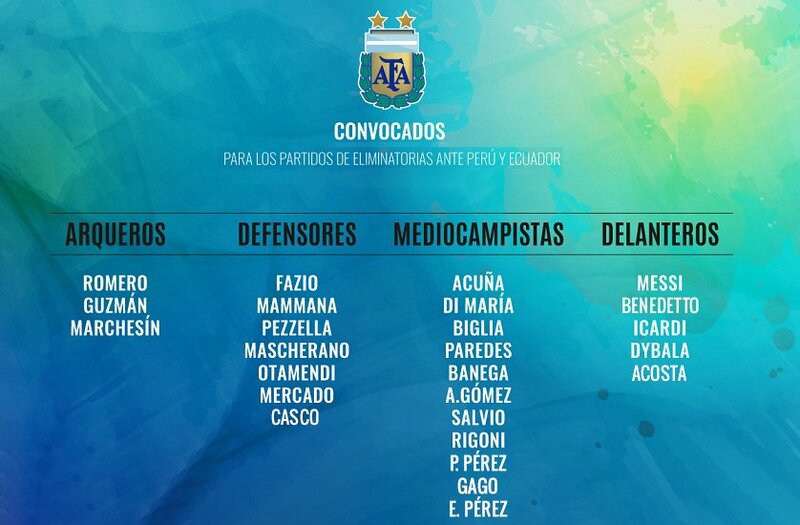 So far we've seen only two of the Big-Five teams to have players in the senior squad of the Argentinian national team. 2014 Apertura winner Racing Club de Avellaneda has at least two players (Sergio Romero and Gabriel Mercado) that made their first steps in the football world at the club. But neither San Lorenzo nor Independiente have even a single player that did come from the Academy. Although Independiente would have one with the currently injured Sergio Aguero and in the current squad we can find with Emiliano Rigoni a former Indenpendiente player. But he was formed at Belgrano like it is the case with Ferro Carril Oeste homegrown Marcos Acuña, who was just sold this summer to Sporting Lisbon from Racing Club de Avellaneda. San Lorenzo? Currently no players in the Senior Squad but with Tomás Conechny and Marcos Senesi, El Cuervo has two promising talents that are currently playing for the U-20s. If progressing right these two players could be joining the senior team in the future and be added to the list of NT players formed at San Lorenzo. Arsenal de Sarandí is the club that was founded in January 1957 by the brothers Héctor and Julio Humberto Grondona. Yes exactly, Don Julio the former president of the AFA and good friend of Sepp Blatter. Arsenal had some successful years under the management of Gustavo Alfaro when they won the league title in 2012 and the Copa Argentina in 2013. Meanwhile Ferro Carril Oeste has never played in the first league of Argentina in the last 10 years. Their best place in the last years was a 5th place in the Nacional B in 2011/12. Nevertheless they brought out players like Federico Fazio and Marcos Acuña. Quite interesting that these two clubs from Buenos Aires could be bring out these quality players. You'd expect one of the Big-Guys to snap the best players from Buenos Aires quite early. The province of Buenos Aires is quite dominating regarding the clubs forming the players thanks to the Big-Five clubs. But everyone that followed the Albiceleste a bit, knows that Rosario has also quite an impact. From the total of 26 still 12 players have been born in province of Buenos Aires which makes almost 50%. But then Santa Fé (where Rosario is located) comes with 9 players. Besides that only Córdoba with two players, and Mendoza, Entre Rios with one single quad player made it to have a player in the Argentinian national team. Keeping in mind that Argentina has 23 (twenty-three!) provinces, it's quite a surprise that the players are only born in five (or six, if counting the city of Buenos Aires as own province) different provinces. On the table above you can clearly see that Santa Fé has clearly one of the biggest impact, keeping in mind that it's nowhere as populated as Buenos Aires. Another interesting fact is that, except the province of Tucumán with no players, all players come from one of the five highest populated provinces.